By September, 1919, Denikin's elite Volunteer Army armed with the latest technology for its time ( Mk V, Whippet Tanks, DH9A bombers, Armor Cars ) had reached the infamous city of Kursk. The next stop was Orel. Then Tula and finally, Moscow! Its 25,000 well trained soldiers were equal in training to a British infantry division were opposed by the Bolshevik 13th and 14th Armies. A collection of polyglot men with dubious training and questionable morale. Some 60,000 of them. Time was running out as the Fall weather set in, both sides knew it. Lenin and Trotsky began the ultimate propaganda campaign to stir the emotions of the peasant workers. Free food and clothing was the lure to fight. Thousands enlisted. For Denikin, he instinctively knew time was short for a variety of reasons and thus launched the, "To Moscow" offensive on Oct 6th. The White player will also feel the pressure of time. The Red player will toss anything and everything to delay and play for time! 200 Miles covers this epic offensive in a unique game design capturing the essence of the battle and the differences between the forces. Use of supply and command is important. The technological edge of the White forces is fragile, yet potent, if it can be harnessed. Cavalry remains the fast moving forces for both sides. 200 Miles contains 280 counters, one 11x17" beautiful map, and rulebook. 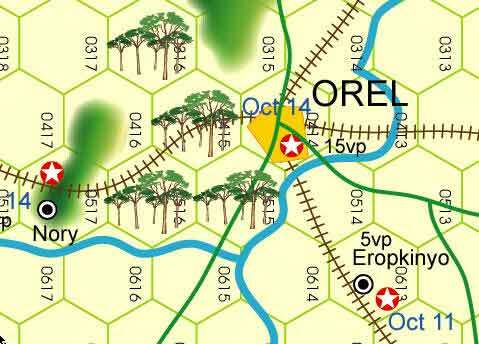 The game scale is 4-5 miles a hex, aircraft counters = 4-6 aircraft, tank units = two tanks, infantry regiments and brigades. 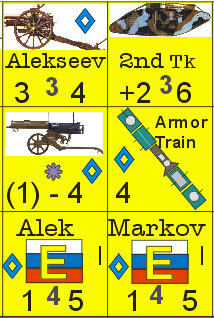 Units include: MkV, Whippet tanks, DH9A Bombers, Re 8 Fighters, Armor Trains, Artillery, Armor Cars, Cavalry, Machine Guns, Engineers, Headquarters. Paul Kantro 10 8 9 A very promising game on a rarely used subject.